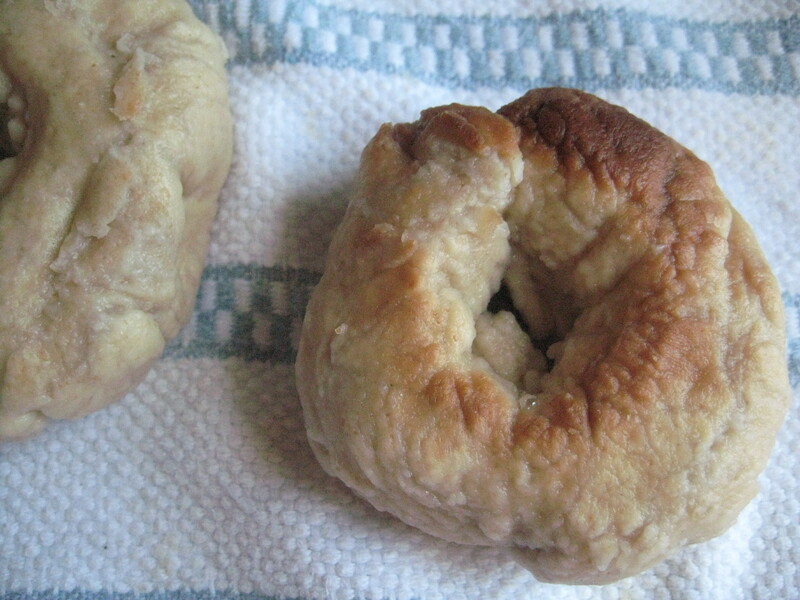 Bagels have always seemed like exactly the type of bread you don’t want to try making at home. So of course we tried making them at home. The verdict? Harder than normal bread, but not by much. The ingredients are just as simple as a normal yeast bread, but there are more steps to perform. And more steps means more points of failure. Ours turned out well except for one or two that were unusually dense. Overall, I recommend the recipe we used, but we’re definitely going to try some other ones. Combine all ingredients except that last teaspoon of honey. We used our food processor, which we’re starting to do with most bread recipes even though it makes us feel like we’re cheating. Well, at least it’s not a bread machine. 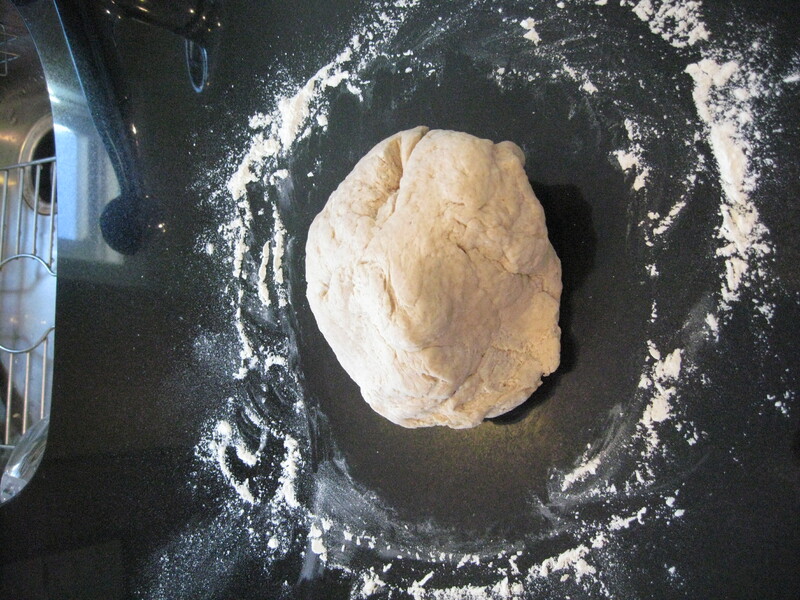 Knead dough on a floured counter for 5 minutes, until elastic. Cut dough into 8 pieces, and cut some of these pieces in half. These yields large and small bagels. Shape each piece into a ball, form a 2-inch hole in the middle, and shape into a bagel. We recommend against doing any more kneading as you do so; our theory is that the two that turned out badly were over-kneaded, but who knows? Place on a non-stick baking pan or pizza stone and broil for 2 mins on each side. Ours browned fast, but the browning wasn’t burning. Don’t worry that you’ve ruined them just because they’re brown. 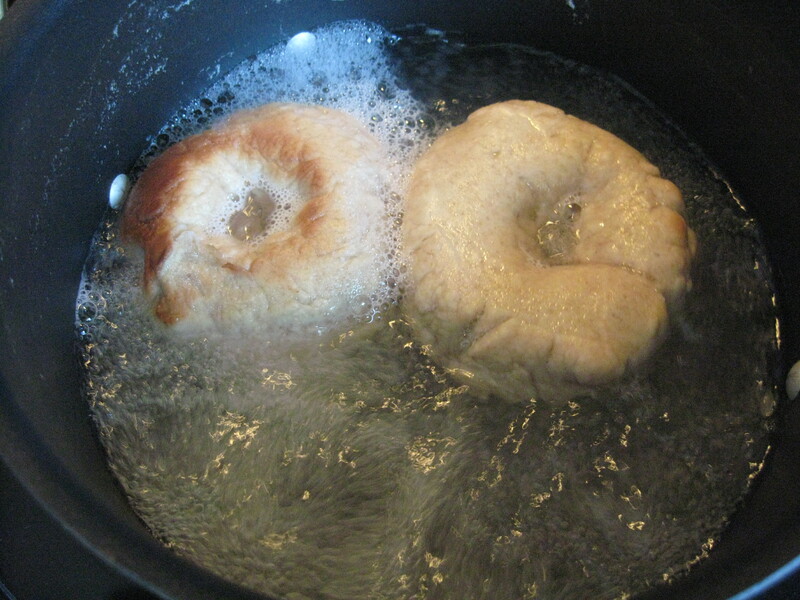 Boil the bagels in water infused with 1 teaspoon of honey for 7 minutes, turning halfway through. We used a stockpot for this, but next time we’ll try a large skillet with high sides, since the width of the pan is what limits the number you can boil at once. Drain the bagels on a towel. Don’t worry if your bagels look a little funky along the way. At various points in this process ours looked wrinkled, shriveled, and soaked (e.g., the picture in the bottom left, in which a bagel drains after being boiled). In the end, it all works out just fine. These three ways of heating the bagels are complimentary and they eventually get the job done. 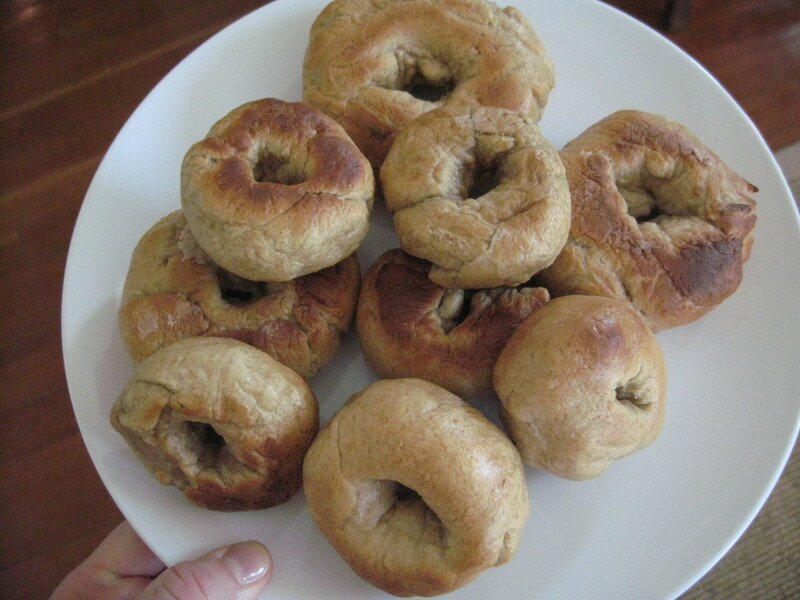 I have my eye on a few different bagel recipes, including this one from King Arthur Flour. I’m also interested in exploring the distinction between New York and Montreal bagels a little further. But my lack of a wood-fired stove will keep me from baking a true Montreal-style bagel, I guess. And, of course, we have myriad topping opportunities to explore. I’ve always been frustrated that bagel shops have either whole wheat bagels or topped bagels but never whole wheat topped bagels. 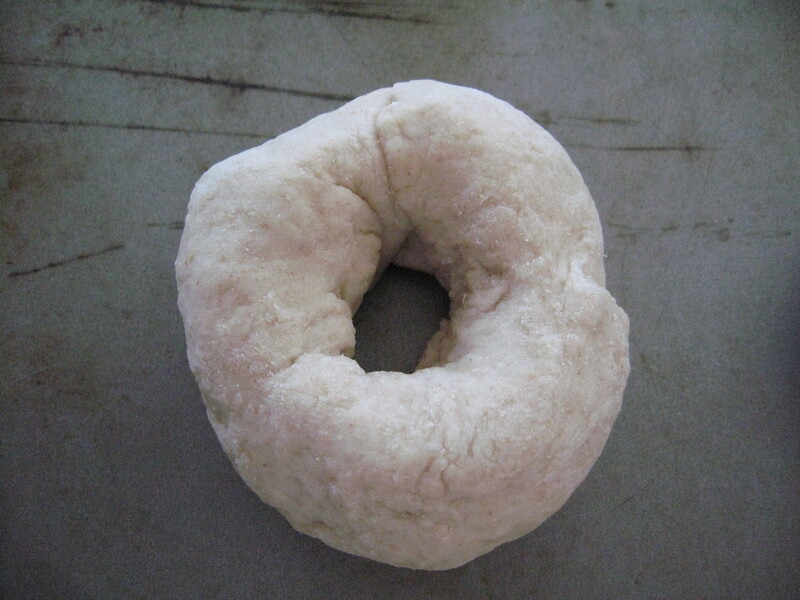 I can’t wait to make my own whole wheat salt bagels, whole wheat onion bagels, or maybe even whole wheat everything bagels. Very homey looking, these bagels.